Waking up, accepting that the day has begun and then quickly getting organized to attack it isn’t always easy. The offensive, blaring siren of some old school alarm doesn’t help much either. To help make mornings easier–and days and nights for that matter–the fine French folks at Holi have developed, Bonjour. Bonjour is a smart alarm clock that, using artificial intelligence and some pretty nifty integrations, essentially behaves like a bedside personal assistant. For instance, one notable feature of the clock is a smart scheduling system that automatically adjusts the configured wakeup time if certain conditions are met. Say you have a meeting for example; Bonjour would check traffic conditions and wake you up earlier than expected if things are getting hairy on the roads. It can even order an Uber earlier if that is preferred. Another example of Bonjour’s smarts is weather condition monitoring. If you like to go cycling or for a run in the morning, Bonjour will let you sleep more if rain is predicted in your area. Rather than being another device for you to continuously set, Bonjour is designed to understand context and seamlessly integrate the users’ plans with the elements of the environment on which those plans depend. In addition to sleep-specific stuff, Bonjour is also designed to help users with their health. When connected to a FitBit, Apple Health, or Withings, Bonjour tracks the user’s activity throughout the day. With that information, Bonjour might suggest the user go out for a run since they haven’t been as active as usual recently (and because it’s beautiful outside). Since Bonjour is connected to the cloud, it is designed to get smarter over time by learning user preferences and gaining new skills through analysis of activity in the user community. The “learning part of the device”, where the artificial intelligence comes in, has three key components. The first component is the analysis and understanding of the user’s basic routines. From knowing what time an individual usually wakes up, to when they usually leave home and how long it takes them to get to work, the device can make customized suggestions designed to optimize their schedule and improve their day. The second component is language learning; your language particularly. The device combines and analyzes data and activity from several different sources to understand what you say and how you ask questions, and then provide the most appropriate response. The third component smart home controls based on behavior and preferences. For example, it can adjust the thermostat and lighting schedules based on wake-up times. 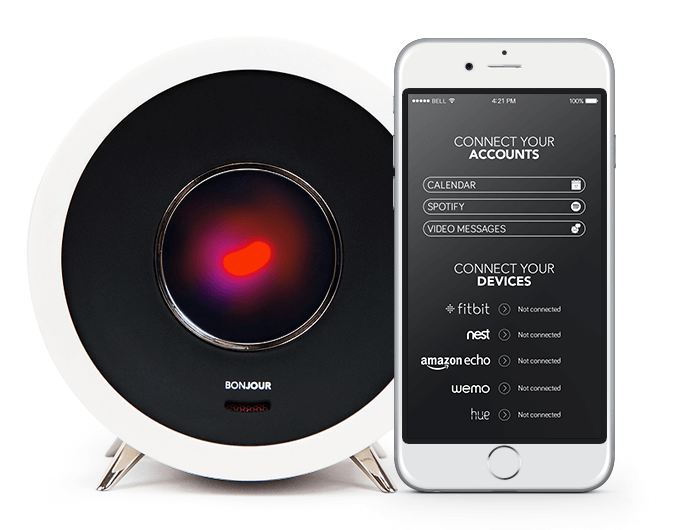 Then of course there are its other integrations: Spotify, Phillips Hue, Nest, Amazon and your mobile messaging. From the alarm clock, you can see video surveillance from your home security cameras. You can even send a video message to someone with Bonjour from your phone and then when they go to bed, they can ask it, “Do you have any messages?” Bonjour will actually play the video message with audio and the visual on its small center screen. Oh, and you can also charge your smartphone with it. Their Kickstarter campaign has been explosive. To date, the company has already raised over $415,000 on a $50,000 goal, and there is still more than three weeks remaining. Pricing for Bonjour (the clock and the accompanying app) started at $99, but as of writing, the most inexpensive reward is $109–still more than 50% off the anticipated retail price of $249. Bonjour expects to make its first round of hellos in June 2017. LOL, yes we do and if the alarm clock can connect to more smart devices, that is even more desirable. The consumer will tell whether something like this needed, right? Demand is a big influence these days. I’m cool with it. Sometimes, my routine needs a little jump start and if this clock is going to be there for me on that front, I would consider it for sure. This is a pretty feature rich product. Having the control that the company claims it does would replace a few other products in your home. Of course, it will have to communicate with other smart devices, but for those on a basic, daily routine, this sounds like a best friend!